Successfully saved 3 Ingredient Vegan Fudge to your Calendar. You can also save the ingredients to your Grocery List. Note: Feel free to add in nuts if you like. I made some plain for my daughter and some with chopped almonds because my hubby loves almonds. Also, make sure to measure correctly. If you add too much coconut butter, it can make the fudge get too soft at room temperature. I let my fudge sit in the fridge for a couple of hours to really harden and then removed it to get back to room temperature. It became the perfect soft, yet firm, fudge texture. I recommend preparing it the day before if you are making it for a party, chill in the fridge, then remove it 30 minutes or so before the party to soften. Depending on the humidity in your area, time may vary on it softening. 1 heaped cup (195g) Enjoy Life semi-sweet mini chocolate chips 1/2 cup (120g) coconut butter 1 teaspoon (5g) vanilla extract optional: sea salt or nuts to sprinkle on top Note: Feel free to add in nuts if you like. I made some plain for my daughter and some with chopped almonds because my hubby loves almonds. Also, make sure to measure correctly. 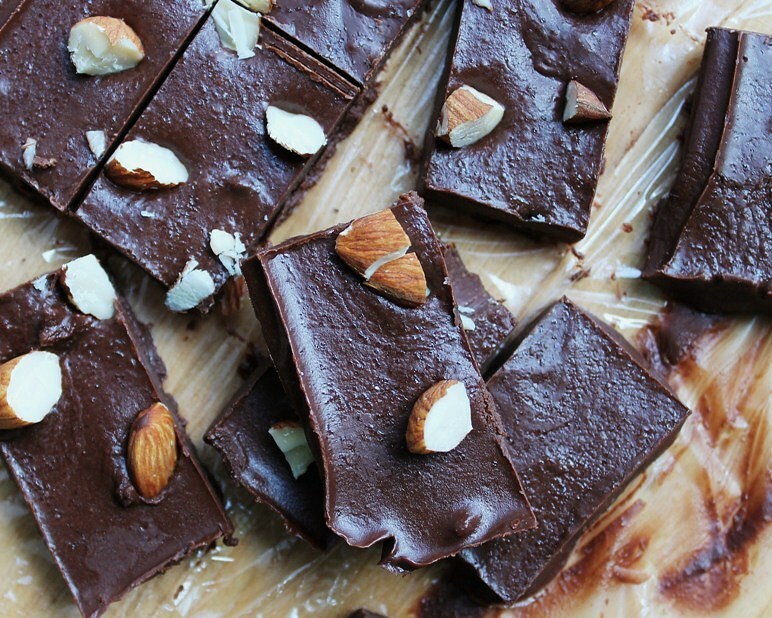 If you add too much coconut butter, it can make the fudge get too soft at room temperature. I let my fudge sit in the fridge for a couple of hours to really harden and then removed it to get back to room temperature. It became the perfect soft, yet firm, fudge texture. I recommend preparing it the day before if you are making it for a party, chill in the fridge, then remove it 30 minutes or so before the party to soften. Depending on the humidity in your area, time may vary on it softening.